“I’ll be your mirror” von Velvet Underground ertönt diese Woche auf dem Scrappping the Music Blog. 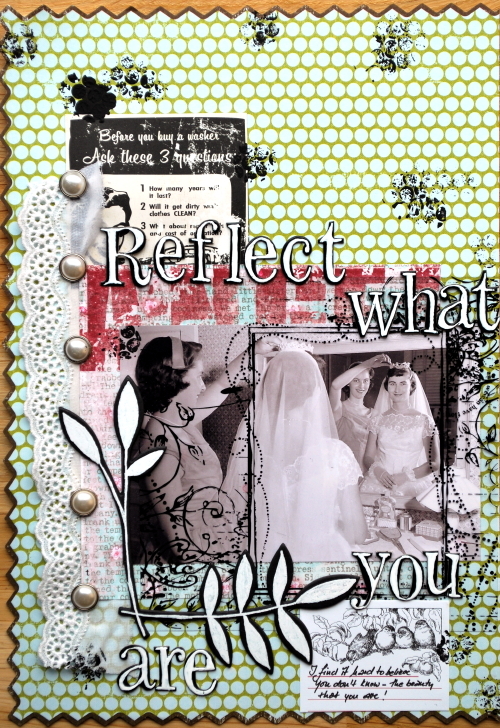 Journaling: I find it hard to believe you don’t know – the beauty that you are! Photo shows my mother in law on her wedding day and her sister. What a gorgeous page, I’m sure she was very happy to see it and read your journaling! Stunning! Gorgeous! And ridiculously amazing! But, would I expect anything less? Ich hätte mich nie getraut so über das Foto zu gehen – mit Stift und Rub on´s (?) – einfach phantastisch !!! That is a beautiful page. I love that vintage photo…it’s priceless! Gorgeous layout! Love the touch of red and those pearl brads are the perfect touch! oh, love the layout, what a cute pic! Also enjoyed myself this morning, thanks for coming by! have a great week! Oh Nat, everything about that layout is perfect! Love, Love, Love the title and journaling especially!